Call x4512 to make your reservation. 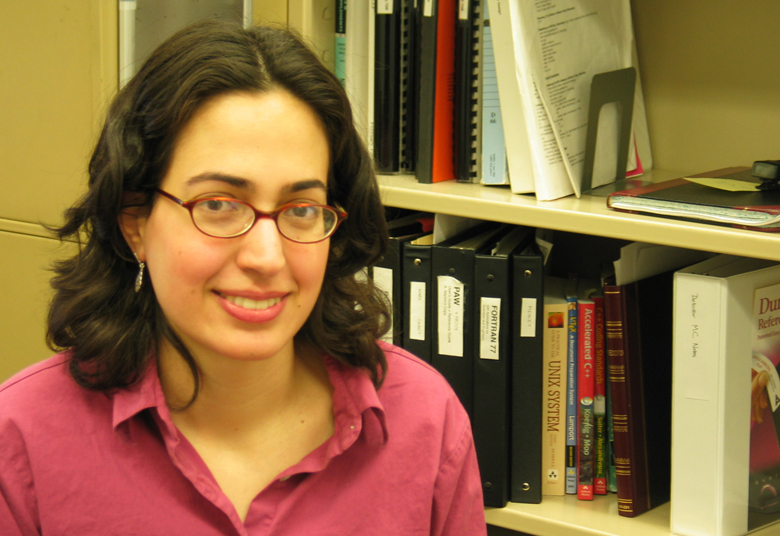 Fermilab physicist Alysia Marino recently won the 2006 Mitsuyoshi Tanaka Dissertation Award for her doctoral research, which supported the hypothesis of neutrino flavor oscillation and also helped solve the so-called solar neutrino problem. The award, given by the American Physical Society, recognizes one outstanding doctoral thesis in the field of experimental particle physics each year. Marino completed the award-winning dissertation at UC Berkeley under the supervision of Kevin Lesko of the Lawrence Berkeley National Laboratory, just before she came to Fermilab. At LBNL, Marino and Lesko worked on a 1- kiloton heavy water detector called the Sudbury Neutrino Observatory. "SNO measures neutrinos coming from the sun," said Marino. "One of the special things about SNO is that it uses heavy water, which is just water with a different hydrogen isotope. To enhance detection of one of the signals, the collabortion mixed in 2 tons of salt to the 1, 000 tons of heavy water, which helped us detect all three neutrino flavors." There are three types of neutrinos: tau, muon and electron. SNO is special because its heavy, salty water makes it sensitive to all three flavors, while most other detectors just pick up electron neutrinos. Since previous detectors only sensed one type, old methods found fewer neutrinos coming from the sun than theory predicted, creating the 35-year-old "solar neutrino problem." SNO results jibed with theoretical models for the first time--solving the mystery once and for all. In addition to solving the solar neutrino problem, Marino's research also provided a smoking gun for the popular theory that neutrinos change flavor as they travel from the sun to the earth, since all nuetrinos coming from the sun start out as electron nuetrinos. Now, after investigating solar neutrino mysteries at Lawrence Berkeley Lab for her PhD, Marino is excited about her post-doctoral research position at Fermilab "We generate a beam of neutrinos at the lab," said Marino, who came to MINOS in 2004. "I like measuring neutrino oscillations from our beamline--it's much easier to control than the sun." proposals on a world-wide basis for siting the International Linear Collider. Although a long road remains to selecting a site for the ILC, facilitator Doug Sarno will tell you it is never too early to start public participation. In anticipation of submitting a proposal to host the ILC, Fermilab started discussions with local citizens, and two years ago, they established a Community Task Force on Public Participation. Ranging from a young high school student to a local mayor, the 22-member group developed a set of mutual expectations for how Fermilab will interact with the community on issues that effect them both. As the site selection for the ILC moves forward, the role of the Community Task Force will become increasingly important and perhaps even serve as a model on public participation for other regions involved in the global project. The record-breaking performance of the Tevatron collider at the Department of Energy's Fermi National Accelerator Laboratory is pushing the search for dark matter, supersymmetric particles and extra dimensions to new limits. Repeatedly smashing peak luminosity records, the Tevatron has created record numbers of proton-antiproton collisions that provide the means to unveil the secrets of the universe. Accelerator experts at the lab announced today (March 2) that in only 14 months the Tevatron collider has produced almost five times the data sample collected during four years of Collider Run I (1992-1996), which led to the discovery of the top quark at Fermilab. Since restarting the Tevatron collider after a scheduled shutdown in December 2004, the collider has produced an integrated luminosity of 872 inverse picobarns-a measure for the number of collisions achieved. Two collider experiments, CDF and DZero, will present new results based on these datasets in the upcoming months. Now through April 26, you'll be able to see glowing charcoals and bright, swirling oil paints in the Fermilab Art Gallery--or, as artist Pam Allnutt describes them, "glimpses of nature." Allnutt paints close-ups of natural scenes--arresting little pieces that the viewer has to think about to put into context. "Pam is one of the few artists who can create pristine, simple striking pieces," said Georgia Schwender, curator of the Fermilab Gallery. "I was initially struck by her charcoals." Allnutt used to paint larger, more comprehensive landscapes, but she says that her work changed dramatically after the events of 9/11. "It brought up painful territory from my own past," she said. "Now the idea of my work is glimpses of the whole...a glimpse into what isn't clearly seen." Allnutt says that she worked solely with charcoal for a time after 9/11, but has recently brought color back into her work--and the effect of the color is striking. Bright blues, greens and oranges swirl in her close-ups of what look like cloud reflection in puddles, oil-slicks and sideways sunsets on the prairie. "The pieces still have discontinuity, but there is more a flow between them so you can connect up the images," she said. "It's the mystery of only knowing part-like pieces of nature seen for a second in the headlights before they disappear." There will be an artist reception for Pam Allnutt on March 10 from 5-7 p.m. on the 2nd Floor Crossover of Wilson Hall. Hatha Yoga makes use of physical poses, breathing techniques, and meditation in order to bring the body in perfect health and for more subtle spiritual elements of the mind to emerge freely. The next 8-week session of Yoga will be March 21 through May 9. The class is held on Tuesdays in the ground floor auditorium from noon to 1 p.m. Recreation Membership is NOT required. The cost for the 8-week program is $80.00. A yoga mat is required. Beginners welcomed. The deadline to register is March 17. Registrations can be made in the Recreation Office or find more information at the recreation classes website. Registration for the Fermilab Summer Day Camp for children, ages 7 through 12 years, will begin March 1. Deadline to register is March 30. Entrance into the camp is made by lottery drawing on March 31. Camp sessions are: I: June 12 - June 30, Session II: July 3 - July 21, Session III: July 24 � August 11. The fee for each three-week session is $265.00. A $100.00 per child/per session deposit is required at the time of registration. More information regarding the camp and registration forms can be found in the Recreation Office, Housing Office, Users Office and on the Recreation web page or call the Recreation Office at x5427 or x2548. Join in on the fun at the Kuhn Barn on Thursday evenings from 6-7 p.m. Learn the newest Country Line Dances (and some oldies!). Both beginners and intermediate levels are welcome. You don't need a partner, but if you have one drag 'em along. The six week session is $30.00. The class will be held March 16 though April 20. Employees, Visitors, Family members, retirees, on-site contractors, and friends are welcome. Registration can be made in the Recreation Office, by mail (the form can be found on the Recreation web page or by phone using a credit card.) Deadline to register is March 13. New classified ads have been posted on Fermilab Today.